Net Revenue = Player bets minus player winnings minus player bonuses minus transaction fees (6.5% of all deposits) and admin fees (23%). Are earnings from different brands bundled – No. Losses at one brand does not impact earnings at another. Country Restrictions for Players – United States of America. 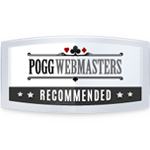 Reputation Status with ThePOGG Network – All of the brands represented by Casino Luck Affiliates hold ThePOGG Deposit Guarantee. This is the highest level of award given by ThePOGG Network and as such Casino Luck Affiliates can be considered one of our most trusted partners. Casino Luck are one of the ‘A class’ of casino operations. They’re reputable and well-liked by players, they offer a great selection of games and for affiliates they offer a highly competitive affiliate program and convert well.